died November 18, 1873 in Newark, New Jersey - age 2 years. Variola is another name for Smallpox, an infectious disease unique to humans, caused by the variola virus. It's a highly contagious viral disease characterized by fever and weakness and skin eruptions with pus-filled swellings that form scabs that drop off, leaving scars. The disease infests itself in small blood vessels of the skin and in the mouth and throat. In the skin it initally appears as a rash and, later, raised pus-filled blisters. Smallpox, which is believed to have originated over 3,000 years ago in India or Egypt, is one of the most devastating diseases known to humanity. For centuries, repeated epidemics swept across continents, decimating populations and changing the course of history. The disease, for which no effective treatment was ever developed, killed as many as 30% of those infected. Between 65–80% of survivors were marked with deep pitted scars (pockmarks), most prominent on the face. A similar but relatively safer disease was cowpox, an animal disease also caused by a virus. The virus got its name from the spread of the disease when dairymaids touched the udders of infected cows. The ailment manifests itself in the form of red blisters and is transmitted by touch from infected animals to humans. When the human patient recovers from cowpox, the person is immune to smallpox. In 1798, Edward Jenner realized that people could be vaccinated with the cowpox virus, thus protecting them against smallpox, and bringing the first hope that the disease could be controlled. This development failed to offer any protection for little Christian because the vaccination process took many years to become accepted as a universal method for protecting people from the deadly disease. In the early 1950s – 150 years after the introduction of vaccination – an estimated 50 million cases of smallpox occurred in the world each year, a figure which fell to around 10–15 million by 1967 because of vaccination. If you were born before 1970, you probably have "the scar" on your arm or leg. In the United States, a mass vaccination strategy was conducted to rid the world once and for all of this terrible disease. After receiving the vaccination, after three or four days, a red, itchy bump developed at the site. After the first week, the bump became a large blister, filled with pus, and then it began to drain. During the second week, the blister began to dry and then a scab formed. In theory, by the fourth week, the scab was supposed to fall off, leaving a “small” scar. For some. For others, it left a huge scar that looked like a bunch of little craters. In 1967, when the World Health Organization launched an intensified plan to eradicate smallpox, the "ancient scourge" threatened 60% of the world's population, killed every fourth victim, scarred or blinded most survivors, and eluded any form of treatment. 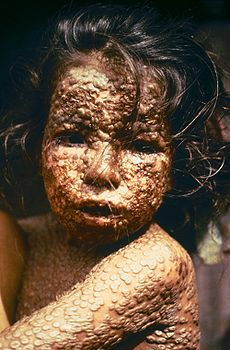 Girl infected with smallpox. Bangladesh, 1973. Through the success of the global eradication campaign, smallpox was finally pushed back to the horn of Africa and then to a single last natural case, which occurred in Somalia in 1977. A fatal laboratory-acquired case occurred in the United Kingdom in 1978. The global eradication of smallpox was certified, based on intense verification activities in countries, by a commission of eminent scientists in December 1979 and subsequently endorsed by the World Health Assembly in 1980.